Playing in quieter atmosphere than at the Coliseum, Isles allow two goals in 22 seconds during third period. Subtract a 22-second stretch that yielded two goals against and two game-turning penalties and the Islanders played one of the best teams in the NHL evenly. Except, that kind of fuzzy math is not allowed in the NHL. The Islanders were back at Barclays Center for a 3-1 loss to the Jets on Tuesday night before a crowd of 9,125, a much more somnolent atmosphere than Saturday’s emotional 3-2 win over the Blue Jackets at a raucous NYCB Live’s Nassau Coliseum as a sell-out crowd of 13,917 celebrated the team’s regular-season return to its ancestral home for the first time since 2015. But the Islanders (13-10-3) did not fall into the trap of a letdown, instead playing a structured game, those 22 seconds in the third period notwithstanding. The Jets (17-8-2), Western Conference finalists last season, were playing for the ninth time in 16 days, with seven of those games on the road. That included a 4-3 overtime win over the Devils on Saturday and a 4-3 shootout win against the Rangers on Sunday. The Jets scored three, third-period goals in that one. The Islanders led 1-0 as captain Anders Lee swept a forehand past Connor Hellebuyck (27 saves) at 1:33 of the third period. 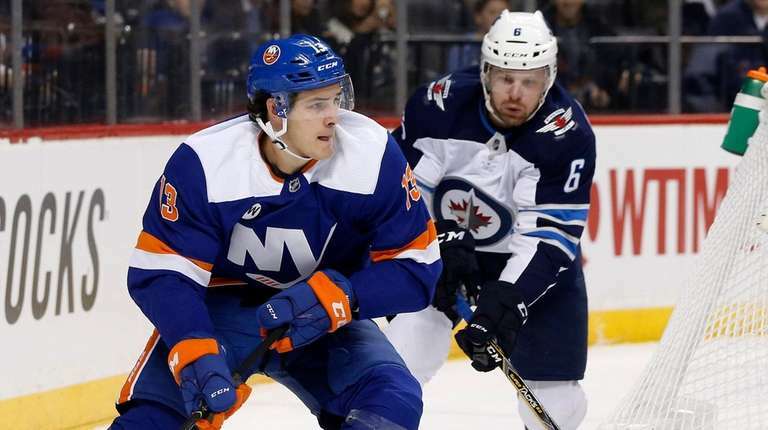 But Mathew Barzal was called for holding Ben Chiarot’s stick in the offensive zone and the Jets’ second-ranked power play converted on Jacob Trouba’s shot through traffic from the blue line at 3:39. Then, Adam Lowry made it 2-1 at 4:01 as he got free to knock in the rebound of Brandon Tanev’s wrist shot. Nikolaj Ehlers’ empty-netter sealed it with 2.1 seconds left. The Islanders had a chance at the equalizer when Tanev tripped Barzal at 8:57. But Lee’s tripping penalty against Tyler Myers at 9:32 negated that chance. The Islanders were 0-for-2 on the power and are now 0-for-17 over their last eight games. Thomas Greiss helped keep it close with 21 saves, including turning aside two close-range chances by Kyle Connor at 18:10 of the second period.